Get low pricing and great service with your next DOT Physical Exam at our convenient clinic located on 2420 E. Griffin Parkway in Mission, Texas. Located in the Rio Grande Valley close to the cities of McAllen, Edinburg, Palmhurst, Alton, La Joya, Palmview, Pharr, San Juan and Alamo. Worried About Passing Your CDL Physical Exam? Dr. Whitaker knows how important it is that you continue your livelihood as a commercial driver. With his extensive knowledge of the DOT Physical Exam medical guidelines, Dr. Whitaker will steer you through the DOT Physical Exam requirements so you can Keep on Truckin’. Not sure if your medical condition will affect your driving status? Just give us a call before your appointment. We are here to answer your questions. Whether you are just traveling thru Mission, TX or one of our local drivers, we are here for you! Looking for a DOT Physical Exam or CDL Physical Exam in Mission, TX? You’ve come to the right place! From Expressway 83, travel north on Shary Road two miles, crossing old Hwy 83, to Griffin Parkway, turn right and travel 1/2 block. Commercial Driver Work Safe is located on the right at 2420 Griffin Parkway. Dr. Gary Whitaker, DC is a Certified Medical Examiner in the National Registry. Dr. Whitaker is a graduate of Baylor University / Army Academy of Health Sciences and Texas Chiropractic College. He served in the US Army from 1971 thru 1978. 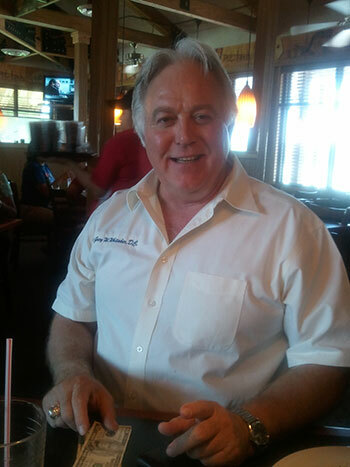 He graduated from Texas Chiropractic College in 1982, and has been a practicing Chiropractor for 33 years, with the last 10 years in Mission, Texas. Dr. Whitaker utilizes various Chiropractic spinal adjusting techniques; Diversified, Gonstead, Thompson Drop table and Cox distraction/ traction. Dr. Whitaker is a regular active church member (North Mission Church of Christ) and participates in local community activities. His hobbies include fishing, hunting, biking, coin collecting, and international travel.